It’s that time of year again! Fall means it’s Saint Paul Art Crawl weekend, and you will find redshoes26 once again at J.A. Geiger Studio on the East Side of St. Paul. We’re not in the “general” Art Crawl area, meaning the Lowertown area, but we’re just a short drive up White Bear Avenue! So “crawl off the map” and find two other guest artists in addition to redshoes26—Tracie Thompson and Katherine Salverda—plus the owner of the studio, Josephine Geiger. 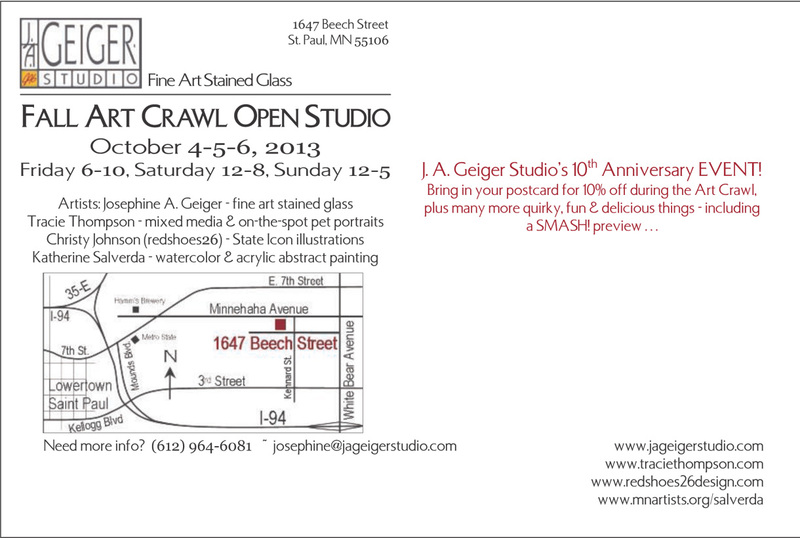 This marks the 10th year Josephine has opened her studio for a show, so she’s celebrating with some really fun opportunities and take-aways. If you bring in your Art Crawl postcard, which I may have handed to you at one point in time, Josephine will even give you 10% off one of her art glass pieces. And take it from me: she never discounts her work, so this is a big deal! I’ll be showing my State Icon illustrations, including new illustrations representing more states, plus my larger State Icon matted prints, mini State Icon holiday ornaments, and postcards. 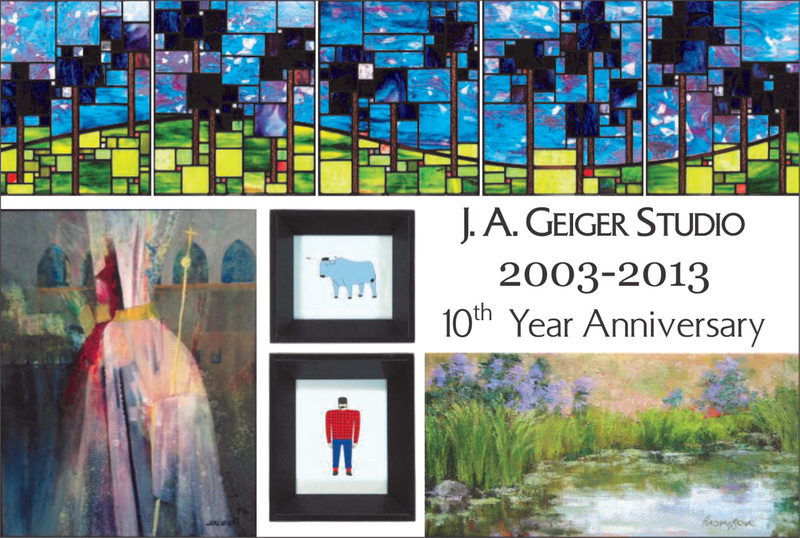 This Friday, Saturday, and Sunday (April 26-28), stained glass artist Josephine A. Geiger of J.A. 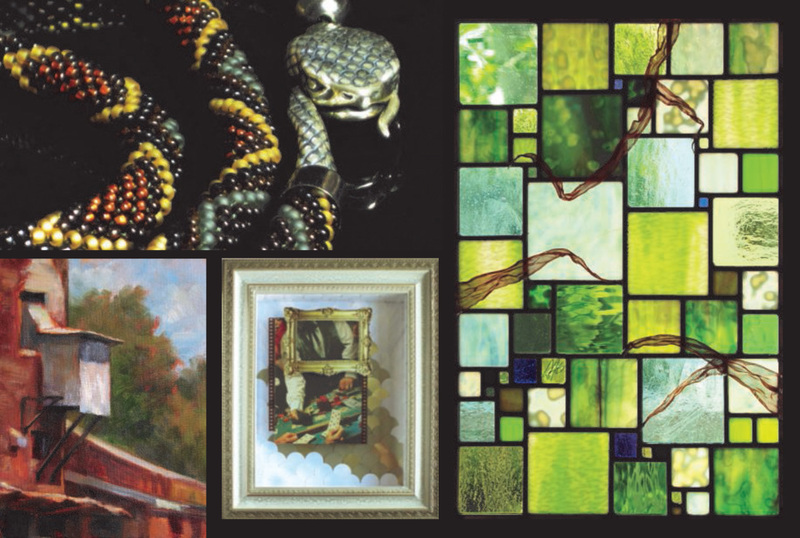 Geiger Studio welcomes beadwork jewelry artist Brenda Brousseau, painter and collage artist Tracie Thompson, and me, mixed-media artist and illustrator Christy Johnson, to her studio for the spring Saint Paul Art Crawl. We’re asking visitors to “crawl off the map” to see our work, as J.A. Geiger Studio is located on the city’s East Side and not Lowertown, the neighborhood where most of the open studios can be found. We’re making sure it will be worth the short trip to visit us! Both Josie and Brenda have each won two Saint Paul Art Crawl Media Awards in past years, and all four of us will be showing new, never-seen-before pieces. Tracie will be doing her on-the-spot pet portraits again, so bring photos of your furry friends! • Friday, April 26, from 5-10 p.m.
• Saturday, April 27, from noon-8 p.m.
• Sunday, April 28, from noon-5 p.m.